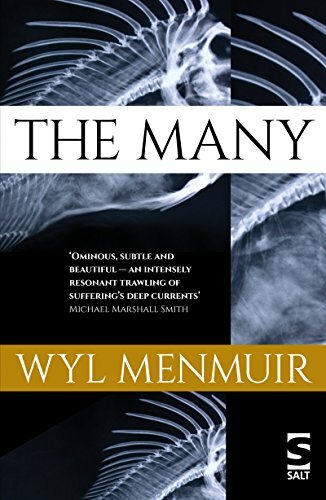 The Many by Wyl Menmuir is a short novel set in a decaying Cornish fishing village. Very few boats work there, and those that do catch nothing in the mysteriously polluted bay, and are forbidden to venture beyond the rotting container ships, inhabited by Hitchcockian colonies of seabirds, that lurk on the horizon. When outsider Timothy buys a long-empty house that once belonged to local boy Perran, the village and its people fill him with a powerful unease - but his fascination for the place (and for Perran, who seems to have acquired an odd, quasi-mythical status in the minds of the fishermen) seems to prevent him from leaving and is every bit as oppressive as his fear. The Many is around 160 pages long, hovering on the border between novel and novella, and I'm glad it's so short because it's such a strongly unsettling book that anything longer would simply be too much. This isn't a plot-driven book at all, so while there are shades of folk horror here, don't expect the story to resolve itself with Wicker Man style twists and don't expect this to be a realistic description of a Cornish village either - it's not realistic because it's not meant to be. Menmuir's writing is evocative and richly descriptive, but never overblown. There are no explanations and endless scope for interpretation; the whole thing has the feel of a frightening dream - not an adrenaline-filled nightmare that would wake you in a cold sweat, but one of those languidly unnerving, anxious dreams in which ordinary things and people acquire a subtle air of hostility, in which logic collapses and an ominous but non-specific feeling of doom gathers throughout. Timothy's is not the only point of view from which we see the events of The Many. Some chapters unfold through the eyes of Ethan, who after a long spell of fruitless fishing expeditions begins to land unexpected catches when Timothy arrives in the village. The fish Ethan hauls in from the contaminated waters in his boat, the ironically-named Great Hope, are sickly, deformed and inedible, but a mysterious woman dressed in grey and assumed to be from the fisheries ministry insists on buying every last one of them. Ethan is also constantly, painfully burdened by his grief for the late Perran - and towards the end of the novel, in flashback sequences, we start to understand why Timothy feels haunted by Perran too. Are Ethan and Timothy two incarnations of the same man? Is the village in which Timothy is trapped a real place at all, or is it symbolic of something quite different? It certainly seems significant that his wife, Lauren, never joins him there and that he becomes increasingly unable to contact her by phone as he desperately continues with his futile attempt to make Perran's cottage into a place in which they could find peace together. There are so many levels on which The Many can be read, but one of the most striking things about it is the profound sense of loss it quietly conveys. It's a novel of mourning - for people, for relationships, for a way of life, for the state of the natural environment. It's an intense and unforgettable read, and its place on the Booker longlist is well-deserved.